The perfectly-cooked steak is many people's idea of the ultimate comfort food. 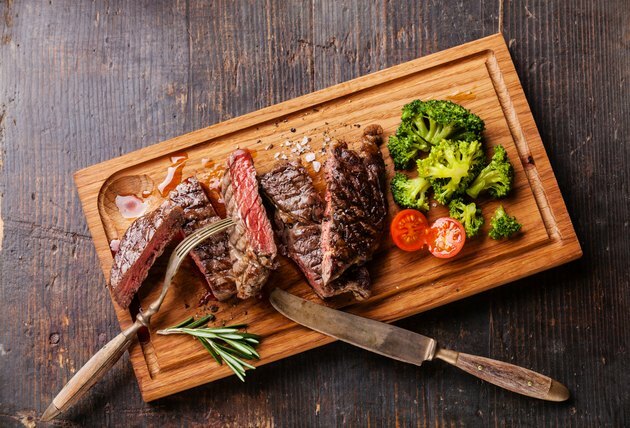 Looking to avoid the expense and hassle of going out to a steakhouse, home cooks -- with varying degrees of success -- attempt to create the perfect steak at home. If you've been frustrated with cooking steak, look to your cupboard. If you've got a bottle of vegetable oil, you've got something that will help you create a meal you won't soon forget. Vegetable oil, like all fats, has a specific smoke point, the culinary term for the point at which a fat begins to burn. For vegetable oil, the smoke point is 450 degrees Fahrenheit, reports Fine Cooking. Though this is lower than the temperatures used to cook steak on the grill or in the oven, that's actually a good thing. Vegetable oil on steak helps create an attractive, deep-brown sear; the layer of carbon created during searing also keeps the meat from sticking to the cooking surface. Grilling is the perfect cooking method when the weather turns warm and you don't want to heat your kitchen. To use vegetable oil to cook steak on the grill, wipe hot, clean grill grates with a clean, vegetable-oil sprayed rag. To avoid burning your hands, hold the rag with long-handled tongs. "Cook's Illustrated Magazine" recommends using a two-level fire, either by piling the majority of charcoal on one side of the grill or by turning off half of the burners once the grates have heated. Sear the steak for three to five minutes per side on the hot side of the grill, then move it to the cooler side to finish cooking to the desired doneness. Grilled steak is a summer classic, but if you're craving steak when it's snowing outside, you can also use vegetable oil to prepare it using your stove-top and oven. Chef Alton Brown recommends preheating the oven to 500 degrees Fahrenheit and heating a cast-iron skillet on high heat on the stove top. Instead of oiling the pan, Brown recommends brushing a light coating of oil on the steak. That way, there won't be extra oil in the pan to burn. Cook the steak for 30 seconds per side on the stove top, and then -- using mitts to protect your hands -- transfer your steak to the oven and cook it to the desired level of doneness. Vegetable oil can give your steak a wonderful sear and help prevent sticking, but it can't do everything. You also need to use the right cut of meat and allow your meat to rest. Good cuts for steak include T-bone, rib-eye or strip steak. Cuts such as chuck or round are too tough to use for steak; save these for roasts and stews. Also, allow your steak to sit for five minutes after cooking it. Cutting it right as it comes off the heat causes all the juices to run out, turning a prime cut into a tough, dry steak.